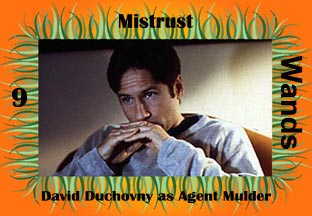 Mulder doesn't know whom to trust. We live in a difficult, paranoid and untrusting time. Your own reality is ultimately the only gauge you have to determine if the paranoia and mistrust are valid perceptions. Fox Mulder personifies the most pervasive strains of this mistrust: mistrust of our government, and fear of Them. Fox was abducted from DD's Devoties.